Do you like chatting in free time? No? Well, hard to digest, you must have been born on another planet! A wide range of social media apps have significantly changed the concept of communication and revealed its new features. It is worth noting that only Facebook alone has 2.23 billion mobile users monthly! Yes, although it is hard to believe it is true! More than 250 to 300 million people are sharing stories on Instagram and WhatsApp separately every day, and 70 million people were posting daily to Messenger day just six months after its launch. These amazing facts have geared up all the social media app development companies to look forward on social media app development. Social media is a network which enables users from all over the world to get connected with their friends, family and distant relatives. These are the networks which allow people, organizations, and companies to create the exchange and share information over it. For example, people can post or share pictures, videos, or they can express themselves through social media. Well, it’s not a lie to say that mobile apps are a boon to all social media sites in a way to grow in this technical era. Mobile Apps are the virtual communities where people can create an account, fill in their details and log in and can simply have the advantage and flexibility of the apps full of features. Few examples of successful social media app are Facebook, Twitter, Instagram, and Snapchat. Mobile apps connect users with people, groups and communities already present in that social media network. This will enhance mobile app development services on the next level. What Statista Says About Social Media? Statista says that social media is the love child of the World Wide Web. It comes in many forms such as blogs, forums, business networks, photo sharing platforms, social gaming, microblogs, chat apps, and social networks. In 2019, it is predicted that there will be around 2.77 billion social media users around the globe, up from 2.46 billion in 2017. According to the survey– Number of worldwide users is expected to reach some 3.02 billion monthly active social media users by 2021. Estimation says that-750 million of these users in 2022 are expected to be from China alone and approximately a third of a billion from India. Popularity says that- The region which the highest penetration rate of social networks in North America, where around 70% of the population has at least one social account. Past Says– As of 2017, 81% of the US population has a social networking profile. Dominating social networks usually have a high number of user accounts or strong user engagement metrics. Let’s take an example, Facebook is the first social network has surpassed the 1 billion monthly active users mark an as of the 1st quarter of 2017, has more than 2.2 billion MAU worldwide. After its launch, relative novice Pinterest was the fastest independent website in History to reach more than 10 million monthly unique visitors but fell behind other players who appeared in recent years, such as photo-sharing social network Instagram or microblogging platform Tumblr. How Social Media Effects Small Business? Do you remember the days of traditional media, when a lot of money is spent to gain popularity through billboards and TV advertising? At the time you have to pay through your pocket. But now the time has changed. Social media has changed everything, and small business has been placed on the same path as the big companies. As a small business owner, you don’t have to run here & there looking for thousands of dollar-before you can reach the target audience with your offers. There is no need for that again. The demand to build a strong brand has floated from traditional to social media. It’s high time you capitalize on this new trend. Now, what is Social Media Marketing? As per Mashable, social media marketing is the process of generating website traffic or attention through social media sites. In brief, it is the process of using social media networks such as Facebook, Twitter, LinkedIn, and more to promote your brand and earn high revenues. Tchibo Company had invested in social media and had earned 1.3 times ROI. L’Oreal uses social media for recruitment purposes and the result they got is 153 applicants. Cadbury’s leveraged its Facebook page to increase 40,000 new fans and 350,000 provoked people who participated in its campaign. Social media is expected to grow above and beyond expectation this year. 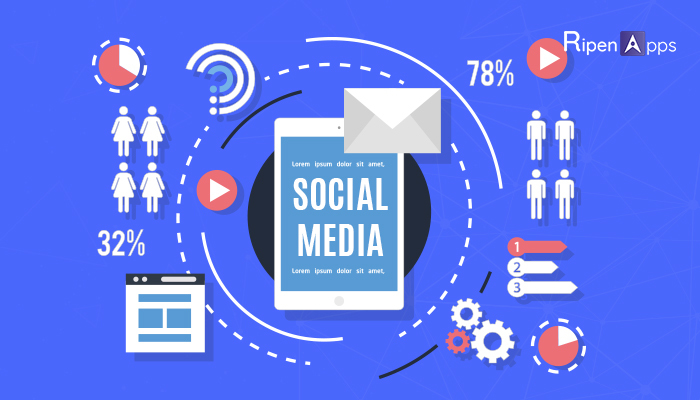 If due to some reason, you were not able to capitalize on the promising social networks and if your business doesn’t use social media marketing to its fullest, don’t worry. Social media is not going anywhere soon, at least not in 2019. The revolutionary social media trends mentioned below will show you why. One of the most common trends that have prevailed 2018 is private social messaging. WhatsApp has 1.5 billion monthly active users while Messenger (Facebook) has 203 million monthly active users. People prefer using social media messages more than communicating & engaging on social media. The ever-growing popularity of these apps is largely accredited to people’s increasing attraction for social messaging. These days, social messaging apps with instant message feature become famous more quickly because they can provide quick and desirable communication solutions. Virtual reality & augmented reality has proven a big thing in the tech industry. The futuristic technologies made the user’s virtual experience. 360-degree videos launched by Facebook and YouTube allow users to share their experiences using VR technology. 3D video chat is an additional possibility to connect and entice your app users. Both these technologies are now ready to provide a more realistic approach. Almost all the dominating social networks enable their users to purchase products within their apps. Think of Facebook, Twitter, Instagram, Pinterest, and recently Snapchat. Live video sharing has taken the social media world by storm as users can stream the live video in real time. The trend becomes more famous because people move to online mediums thereby forcing the content providers to shift their focus to the content streaming. In coming days, live video streaming will become one of the most important features of social media apps. Social networks are as smart as search engines are. They use algorithms to personalize the unrefined social content based on what their users will adore. This is why brands spend especially on social advertising year after year. According to statistics, paying on the advertisement on social ads increased year after year. Revenue in the Social Media Advertising segment amounts to US$67,971m in 2018. Revenue is expected to show an annual growth rate (CAGR 2018-2022) of 28.4%, resulting in a market volume of US$185,026m by 2022. The average revenue per Internet user currently amounts to US$22.84. Social media app with all necessary features can generate high revenue and offer many business benefits. It can give you higher ROI with a proper social media app development process and right promotional approach. At RipenApps, our expert app developers have accomplished several social media app projects. We can incorporate various technologies to make a unique social media mobile app for iOS or Android for your business.